Irrevocable trusts are usually intended to last for a long period of time and to provide for the needs of the beneficiaries according to the trust settlor’s wishes. Because the trust is irrevocable, there are rarely any changes made to the terms of the trust unless they were specified within the trust documents. However, there are some circumstances that the trust settlor cannot anticipate, and changes may be required even when there are no provisions allowing for the change in the trust documents. Although irrevocable trusts are virtually unchangeable once the trust is settled, in some circumstances, even an irrevocable trust in Florida can be changed. A Florida court can generally change the provisions of an irrevocable trust if the change is allowed under the Florida Trust Code. Under the Florida Trust Code, the court can only make changes to or modify the terms of the trust if doing so would not frustrate the trust settlor’s intent, that is, the court can only make changes that are consistent with the trust’s purpose. The court can also make changes if the purpose of the trust has become wasteful, illegal, or impossible to fulfill. When these factors are present, the trustee or a beneficiary under the trust can ask the court to make the required changes to the trust. In determining whether to make the requested modification to the trust, the court may look to the facts and circumstances surrounding the creation of the trust, as well as at evidence of what outside make the modifications necessary. If the court finds that changes are necessary, the court can make any change, from the way the beneficiary receives payments from the trust to the termination of the trust and the distribution of the trust property. The court can also direct the trustee to take certain actions or prohibit the trustee from taking certain actions related to the trust that would otherwise go against the trust provisions. If the trust provisions truly no longer adequately provide for the trustees as was intended by the trustee, then asking the court for a modification of the trust is the best way to get the trust changed. However, if there is a disagreement between the beneficiaries and the trustee, or if the trustee is misappropriating the trust assets, and this is why the beneficiaries are not receiving the benefits they are supposed to, then there is another approach. In these cases, the trustees can sue to have the trustee held financially accountable. 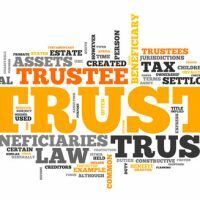 Most trusts name an alternate trustee in case something happens to the primary trustee. Therefore, a court would generally not need to make changes to name a new trustee. If you inherited property as a beneficiary of a trust, and you believe that the terms of the trust should be changed to better address your needs, you need to contact an experienced trusts attorney for a consultation. For more information, contact an experienced estate planning attorney from the Millhorn Elder Law Planning Group located in The Villages, Florida.